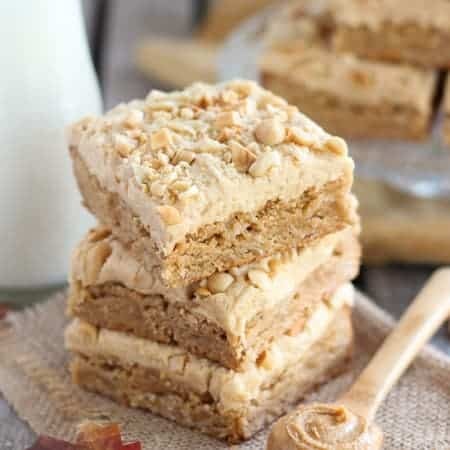 The BEST Peanut Butter Brownies! 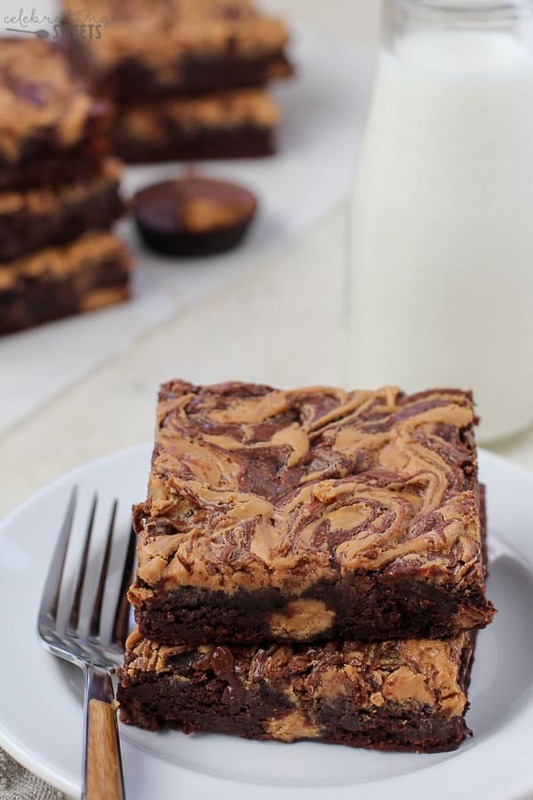 Fudgy brownies filled with peanut butter cups, topped with a peanut butter swirl. RECIPE VIDEO below! 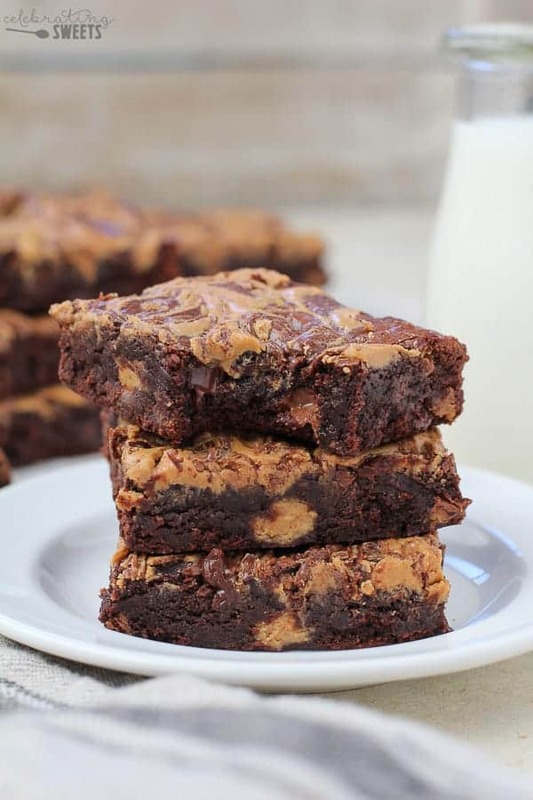 Anyone else need a pan of Peanut Butter Brownies to make it through the week? This here is what dreams are made of. Do you see that peanut butter swirl? Those chunks of peanut butter cups? That fudgy goodness? If you’ve been around for a while you know that there is no shortage of brownie recipes on this site. Coconut Brownies, German Chocolate Brownies, Mug Brownie, Strawberry Brownies, Almond Sea Salt Brownies… and the truth is I’m not stopping anytime soon. If loving brownies is wrong, this girl does not want to be right. We whip up a super easy homemade brownie batter, then stir in chopped peanut butter cups. The brownie batter gets poured into a pan, then we generously dollop and swirl peanut butter all over the top of the batter. Put the pan into the oven and then, (sigh) wait the longest 30 minutes of your life while they bake. Tick tock, tick tock. Line the pan with foil for easy removal. Once the brownies have cooled, you can lift the whole batch right out of the pan using the foil. It makes for super easy cutting. 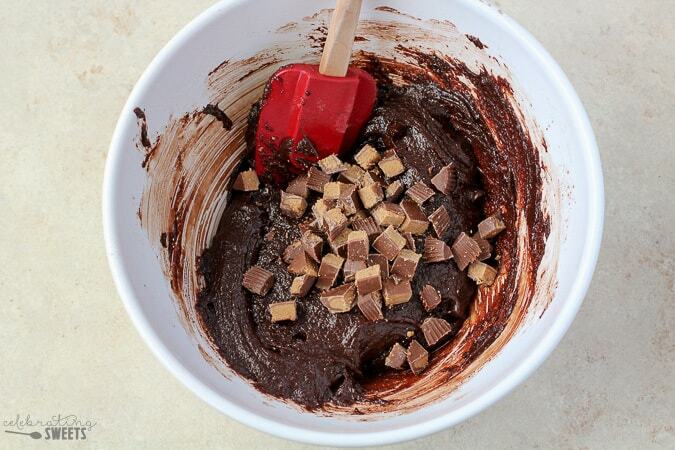 Add some chocolate chips into the batter. 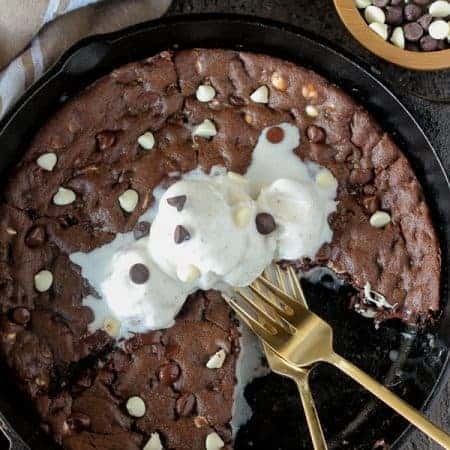 This guarantees you melty-fudgy bites every time! Do not overbake them. I can’t stress this enough! If you insert a toothpick into the center it should have moist fudgy crumbs on it, but no batter. As soon as that happens, pull them out. Since all ovens bake differently, set your timer for earlier than the recipe calls for and keep checking them until they’re done. 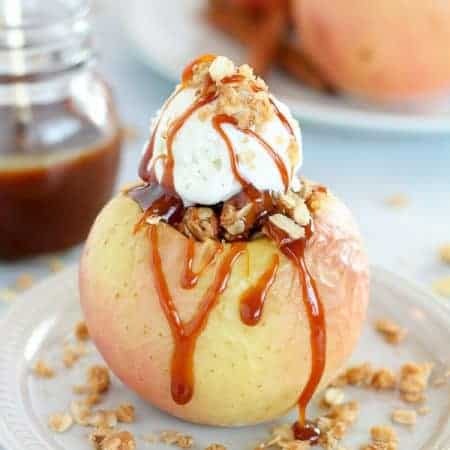 Check out my step by step video to see how easy this recipe is. If you love chocolate and peanut butter, this one is for YOU! Enjoy every bite! Note: This recipe originally appeared in 2015. I have updated the photos and added a video, but the recipe remains the same. 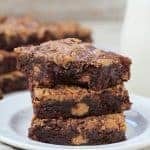 The BEST Peanut Butter Brownies! 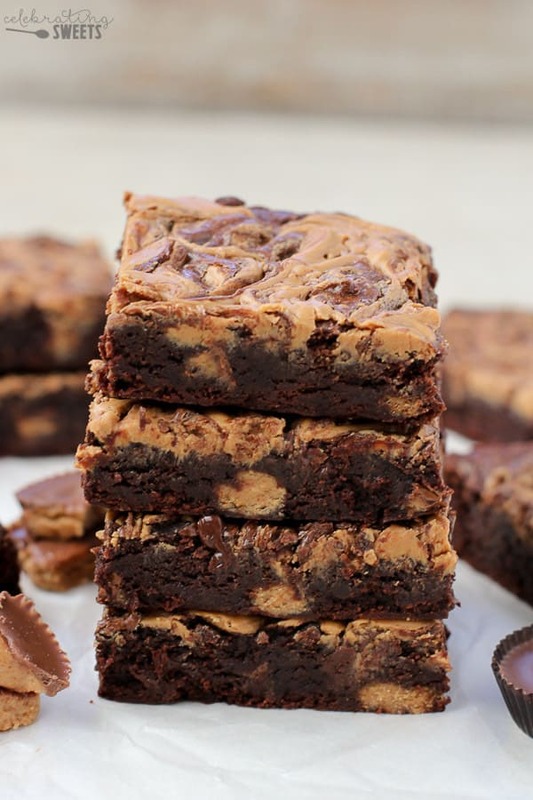 Fudgy brownies filled with peanut butter cups and topped with a peanut butter swirl. Preheat oven to 350°F. Line a 9x9 pan with foil, leaving a couple inches of overhang on two sides (this will allow you to lift the whole tray of brownies out of the pan for easy removal). Butter or spray it. In a large bowl combine cocoa powder, sugars, salt, flour, espresso powder, and chocolate chips. Whisk until combined. Add eggs, oil, and water and stir until combined. Fold in peanut butter cups. Pour the batter into the prepared pan and smooth the top. 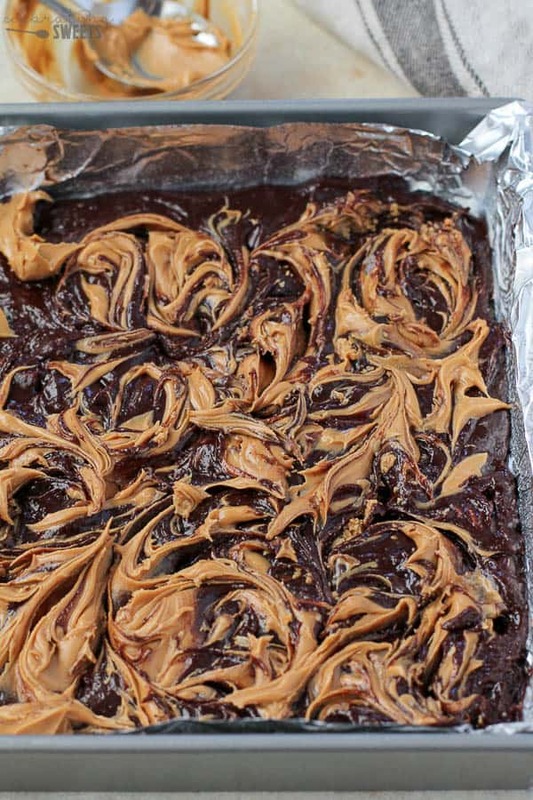 Drop dollops of peanut butter on the top of the brownies, and use a knife to swirl it around. Bake for about 30 minutes. The brownies are done when the top is dry and a toothpick inserted into the center comes out without raw batter on it (there may be some fudgy crumbs on the toothpick - that's OK). Be careful not to over bake. Remove from the oven and place on a cooling rack. Cool completely. You should be able to make them in an 8×8. They will be a bit thicker, so they will take a little longer to bake. Just watch them closely so that they’re not overdone. Enjoy! Why does recipe say peanut butter “not natural”? I have jiffy natural pb. Does that work? Well, trying it now anyway! Hi! Yes, the Jif “natural” will work . I meant the kind of natural peanut butter that is only ground peanuts and has a layer of oil at the top (it could separate in the brownies), and that type of peanut butter is not good for baking. Hope you enjoyed them!